THIS PRODUCT IS DESIGNED TO WORK WITH BNR TUNES AND HOLD 20+ PSI OF BOOST. IT MAY OR MAY NOT BE COMPATIBLE WITH OTHER TUNING SOLUTIONS. NOT COMPATIBLE WITH STOCK ECU TUNING. NO REFUNDS ON THIS PRODUCT, ALL SALES ARE FINAL. Crank up the boost with BNR's upgraded wastegate actuator for your GM 1.4T! One of the common failure points on the factory turbo is the weak rubber diaphragm inside the wastegate actuator. Over time, heat, stress, and use cause it to wear out/weaken, and the actuator can no longer keep the wastegate shut tight. This product completely resolves that issue by using a metal piston design that will not wear out. This product is designed to put more preload on the turbocharger's wastegate flap, which allows boost to come on faster and stronger, and helps maintain boost at higher RPM. The amount of preload is adjustable simply by tightening or loosening the actuator rod. We recommend starting with one full turn of preload and testing your boost from there. Once you've determined where the boost is sitting, you can decide to go tighter or leave it alone. Too much boost will trigger an overboost condition on the ECU and put the car into "limp home" mode, where you will lose all boost. This likely means you have tightened it too much, and need to loosen the rod some. This little mod is so helpful to not only get the crappy oem actuator out of there but to effectively and continuously maintain boost without compromising safety. This thing was built well and designed better; I love it and it was super easy to put on. 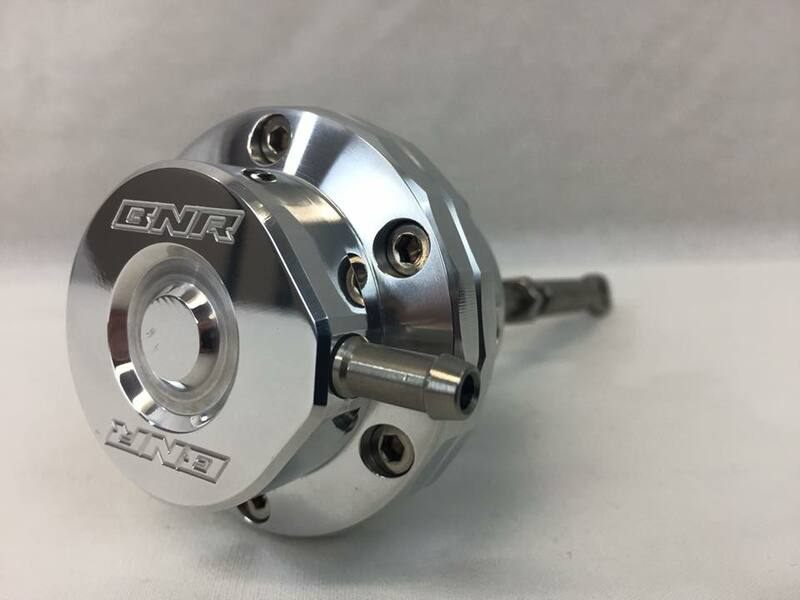 BNR is by far the best out there that makes their own parts! A must have to unleash the power of the BNR Tune. back story- i was getting a CEL for a waste gate code and after running through everything in the turbo system, determined it was the tune... thought to myself it could also be a weak or improperly adjusted wastegate actuator...I saw that BNR makes an upgraded one so i figured why not try it first. Just installed this yesterday and its like a night and day difference. I was having slight issues just getting to 17 psi. with this new actuator it hits 20 psi (where i am tuned for), and seems to come into boost a little bit faster. I can say this is a well designed part and it is great to fall in love with your car all over again. BNR comes out on top yet again releasing another outstanding product! ( BNR Wastegate Actuator ) As for the product goes, it's a well-rounded great product. I'm very impressed with the results this gives you, definitely worth the purchase to anyone that's interested. It's an easy install and very well constructed component. It's made of high quality, the looks are pure pleasure, and overall very remarkable results. It's amazing how much effect one component can make for the better. Very well done BNR Phil K.
My car was down to 15psi constant, and this woke it right up. Feels like I went from stock to tuned all over again.